Today I started sorting the beast! 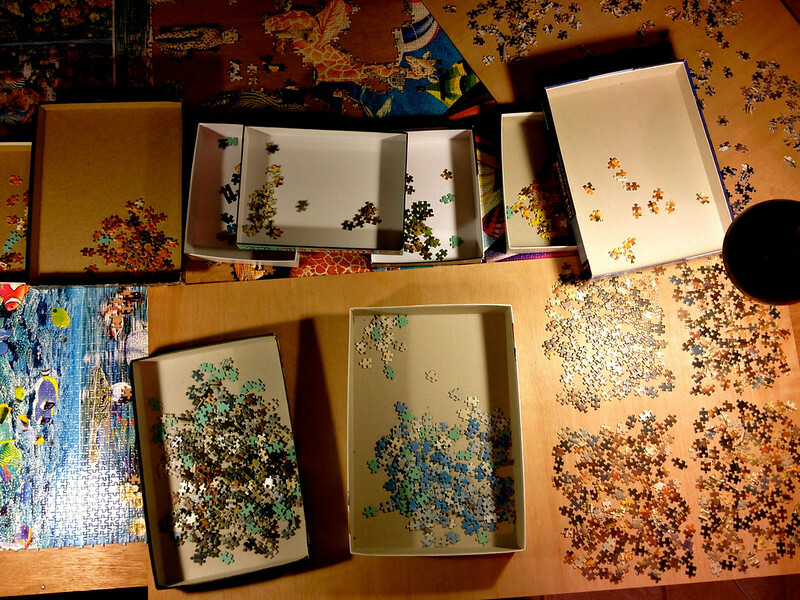 9000 pieces all together feels more like a million. I really am having trouble deciding what to sort some of the pieces into. Someone recently asked me about sorting, and this is the technique I am using on this puzzle. First I am taking my 1000 piece bags (from the counting yesterday) and flipping every piece over. Then I sort out obvious; edge, colors, sky, architecture, outfits and faces. This leaves behind a lot of dark or random or pieces I would have to spend a lot of time hunting in the poster to figure out what the heck it is. I have decided to leave these pieces flipped over (about half of the first batch). This should work out across each bag so that in the end, I will have about 10 sections of pieces and 5 boards of lose pieces to hunt throw as I do each section when I need more pieces. I also dont just leave my board of mixed pieces just one big pile. I always put some divided a board into about 6 to 8 sectors so that while searching, you can focus your eyes on a small sector. It helps to keep from overloading your brain and know you have searched it before moving to the next sector, I find it extremely helpful, your mileage may very. I started sorting Wedding Feast at Cana. You can see I have 10 sorting containers and what is left is put into sectors to make it easy to look through.